This review is all about my most recent Trekkie purchase, a childhood favourite game of mine – Top Trumps, Star Trek style! 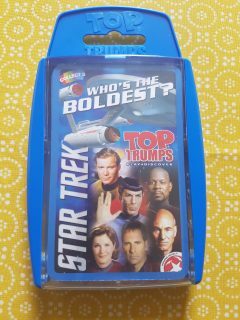 As a child and teenager, I loved playing Top Trumps, especially the versions that were based on films and nerdy things, such as Lord of the Rings or Star Wars. I remember at school pitting Galadriel against Gandalf and Han Solo against Darth Maul and loving the card games! I’m going to Destination Star Trek in Birmingham in October 2018 (my first Star Trek convention since the first one I ever attended way back in 2003) and I’m house-sharing with some fellow Trekkies to save on accommodation costs so that I have more latinum to purchase photos, autographs and trek merchandise! As part of house-sharing me and my DST housemates will be playing some trek games, such as Star Trek Scene It and Star Trek TNG The Interactive Video Board Game. 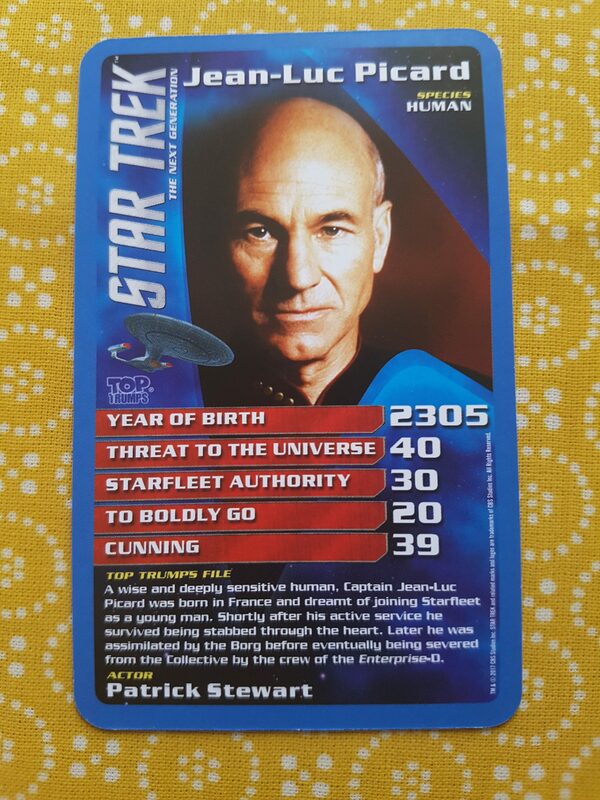 I thought I’d purchase Star Trek Top Trumps to add to the Trek games collection so even when we’re not at the convention, we’ll still be getting our geek on trek style! The other players then select the top card of their pile and do the same, reading out the character and the figure of the category that has been chosen (e.g. Worf, Cunning, 49). The player with the highest number in the category that has been chosen wins and takes the other players cards. In this instance, the player whose card is Worf would win and would take both the Worf and Spock cards and put them at the bottom of their pile of cards. Whoever wins the round then repeats the process and chooses a category on the top card of their pile and so on. When a player has no more cards left they are out of the game. The game continues until there is only one player remaining and they are declared the winner. Alternatively, you could set a time limit and when the time is up whoever has the most cards is the winner. Each card has a picture of a different character, with their name and species at the top right of the card. 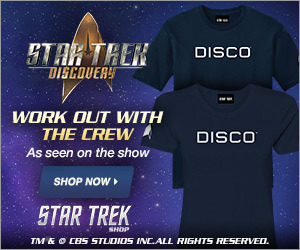 To the left of the picture of the character is a picture of the starship from the series which the character is from which is a nice little touch to identify which Star Trek series the character is from. 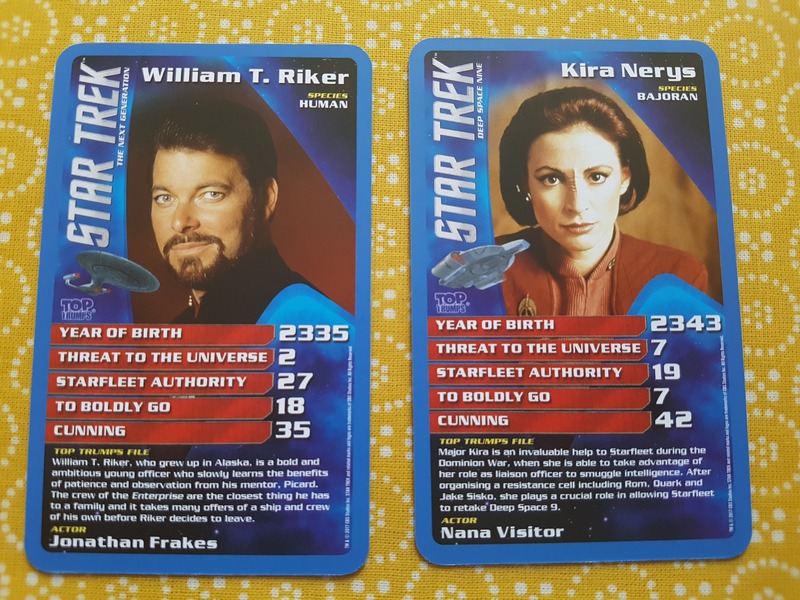 We get some interesting stats such as the year of birth of each character and an insight into their personalities, through their threat levels, their cunning score and their Starfleet authority score. Below their stats, there is a blurb giving some general information about the character including the actors who played them. It’s a great little purchase at a bargain price of only £4.00 on Amazon! 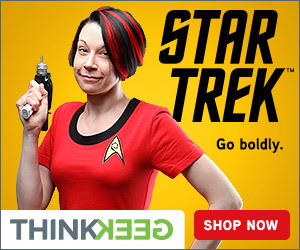 I’m really looking forward to playing it with fellow Trekkies at Destination Star Trek in Birmingham in October! If you’re going to DST in October 2018 – come and say hi to me! I’ll bring the game along and would be more than happy to give my fellow convention goers a game! As always, you can get in touch with me on twitter – I’m @TrekkieRob and I’m always up for chatting about Star Trek and meeting new people who are just as nerdy and geeky as me! You can also find me on my Trek Book Club twitter account (@TrekBookClub) where we read a Star Trek book each month and come together to discuss it on Twitter at the end of every month. You can also find me with my co-host, Rick (@TrekFanRick), on our Trek Book Club podcast, where we discuss each book we read for Trek Book Club.